Winter temperatures in California are on the cool side and the landscape is at its greenest. Wearing socks provides just the extra bit of warmth needed to stay comfortable. 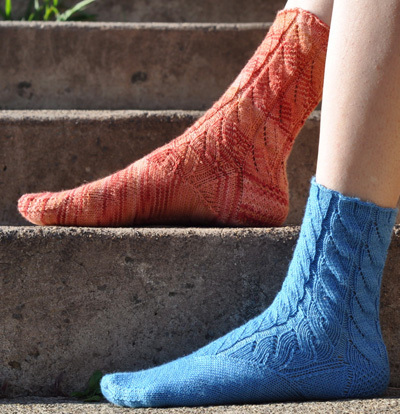 This socks mixes it up with an unusual rib, lace and a shaped arch. The faux cable and lace pattern captures the nature of the volcanic mountains that form the interior landscape between Northern California and Southern Oregon. 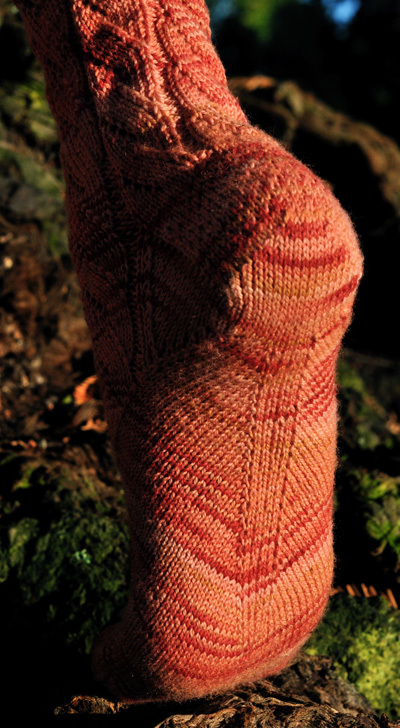 The ribbing flows effortlessly into the pattern that makes up the leg of the sock and reminds me of flowing lava. The foot features a shaped arch, which was inspired by reading about Elizabeth Zimmermann's shaped arch knee socks. The arch shaping biases the fabric in the foot, providing a very snug fit that does not shift around in your shoe. Note: Read through directions for the gusset and arch shaping before beginning this part of the sock. 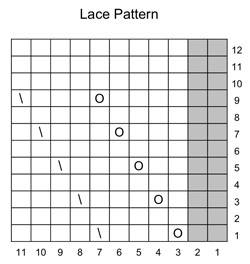 When working the foot and arch shaping, you may find it helpful to rearrange the stitches every few rounds so that you maintain approximately the same number of sts on each needle. M1: insert right needle into the back of the st below next st on left needle and knit into this loop. Round 1: [P2, YO, k3, SSK, k4], rep to end of round. Round 2 and all even rounds: [P2, k9], rep to end of round. Round 3: [P2, k1, YO, k3, SSK, k3], rep to end of round. Round 5: [P2, k2, YO, k3, SSK, k2], rep to end of round. Round 7: [P2, k3, YO, k3, SSK, k1], rep to end of round. Round 9: [P2, k4, YO, k3, SSK], rep to end of round. Round 11: [P2, k9] rep to end of round. Distribute across your needles as you prefer and join for working in the round being careful not to twist. Place marker for beginning of round. Ribbing round: [P2, k4, p1, k4], rep to end of round. Work 6 more rounds in Ribbing. Work rounds 1 - 12 of lace pattern 6 times. Set-up row for heel flap [RS]: P2, k9, p1, turn. Row 1 [WS]: Sl 1, p15, p2tog, p15. 32 heel sts. Remaining 33 sts are held for the instep; place on holder, if desired. Proceed to next step. Set-up row for heel flap [RS]: p2, k9, p2, k7, turn. Row 1 [WS]: Sl 1, p 37. 38 heel sts. Remaining 39 sts are held for the instep; place on holder, if desired. Row 2 [RS]: [Sl 1, k1], rep to end. Row 3 [WS]: Sl 1, purl to end. Row 4 [RS]: Sl 1, [sl 1, k1, rep to last st, k1. Row 5 [WS]: Repeat Row 3. Repeat Rows 2-5 6 more times. Size S only: repeat Rows 2-4 once more. Size L only: repeat Row 2 once more. Row 1 [WS]: Sl 1, p17 , p2tog, p1, turn. Row 2 [RS]: Sl 1, k5, SSK, k1, turn. Row 3 [WS]: Sl 1, p6, p2tog, p1, turn. Row 5 [WS]: Sl 1, p8, p2tog, p1, turn. Row 6 [RS]: Sl 1, k9, SSK, k1, turn. Row 7 [WS]: Sl 1, p10, p2tog, p1, turn. Row 8 [RS]: Sl 1, k11, SSK, k1, turn. Row 9 [WS]: Sl 1, p12, p2tog, p1, turn. Row 10 [RS]: Sl 1, k13, SSK, k1, turn. Row 11 [WS]: Sl 1, p14, p2tog, p1, turn. Row 12 [RS]: Sl 1, k15, SSK, k1, turn. Row 13 [WS]: Sl 1, p16, p2tog, turn. Row 14 [RS]: Sl 1, k16, SSK.18 sts rem. Row 13 [WS]: Sl 1, p16, p2tog, p1, turn. Row 14 [RS]: Sl 1, k17, SSK, k1, turn. Row 15 [WS]: Sl 1, p18, p2tog, p1, turn. Row 16 [RS]: Sl 1, k19, SSK, k1. 22 sts rem. Round 1: Pick up and knit 16 sts along right edge of heel flap; pm (this will be known as marker 3); work in established pattern over 33 sts of instep; pm (this will be known as marker 4); pick up and knit 16 sts along left edge of heel flap; k3, pm (this will be known as marker 5), k6, pm -- this marks the beginning of the round and is marker 1. 83 sts total. Round 2: K6, pm (this will be known as marker 2), k to 3 sts before marker 3, k2tog, k1, slip marker, work in established pattern to marker 4, slip marker, k1, SSK, k to end of round. 2 sts decreased, 81 sts. Round 3: K to marker 3, slip marker, work in established pattern to marker 4, slip marker, k to end of round. Rounds 4: K to 3 sts before marker 3, k2tog, k1, slip marker, work in established pattern to marker 4, slip marker, k1, SSK, k to end of round. 2 st decreased, 79 sts. Round 5: Rep Round 3. Round 6: K2, m1, k to marker 2, slip marker, SSK, k to 3 sts before marker 3, k2tog, k1, slip marker, work in established pattern to marker 4, k1, SSK, k to 2 sts before marker 5, k2tog, slip marker, k to 2 sts before end of round, m1, k2. 2 sts decreased, 77 sts. Repeat Rounds 5-6 6 more times, and then work one more round 5. 65 sts. Next round: K2, m1, knit to marker 2, slip marker, SSK, k to marker 3, slip marker, work in established pattern to marker 4, slip marker, k to 2 sts before marker 5, k2tog, slip marker, k until last 2 sts, m1, k2. Following round: K to marker 3, slip marker, work in established pattern to marker 4, slip marker, k to end of round. Repeat last two Rounds 17 times more. Note: As you work these repeats, markers 2 and 5 will travel towards the center of the instep. At the end of repeat 12, marker 2 will be in the same place as marker 3, and marker 5 will be in the same place as marker 4. As you continue to work, keep markers 3 and 4 in place, continue moving markers 2 and 5 towards the center of the instep, and work the lace pattern stitch between markers 2 and 5. Next round: K to 2 sts before marker 2, k2tog, k1, remove marker; knit to marker 5, remove marker 5, k to end of round. 64 sts rem. Markers 3 and 4 stay in place. Work plain rounds until foot from back of heel measures 2 inches shorter than desired length from back of heel. Round 1: K to 3 sts before marker 3, k2tog, k1, slip marker, k1, SSK, k to 3 sts before marker 4, k2tog, k1, slip marker, k1, ssk, k to end of round. Rep Rounds 1 and 2 8 times until 32 sts remain. Work round 1 4 more times until 16 sts remain; knit to marker 3. Break yarn. Graft toe together using Kitchener st.
Weave in ends. Block, if desired. 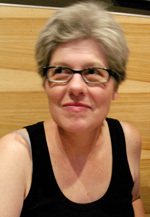 Marlowe knits, spins and designs in Northern California. She blogs here.